The author described it perfectly. The Internet is no longer defined by desktop users, but by desktop and mobile device users. Given this, why should you serve up different versions of your website? 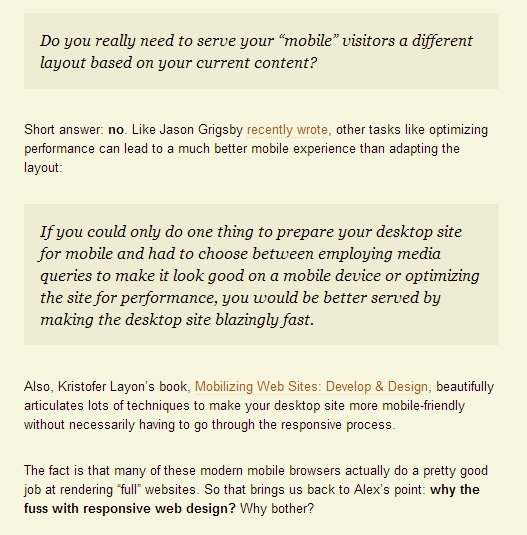 The answer is mobile-responsive web design which adjusts to whatever screen it is being viewed on. The point of creating adaptive sites is to create functional (and hopefully optimal) user experiences for a growing number of web-enabled devices and contexts. Customer satisfaction has a way of making them come back for more. Even if they don’t buy anything the first time out, they’re more than likely to return for other things because of their initial encounter. Better experiences mean more conversions, more engagement and a better chance the user will walk away with a positive feeling about your brand, service or product. At first many online marketers dismissed responsive web design as an artistic trend to impress and attract clients. As it turns out, practically every web designer in Perth is relieved that they no longer have to design separate versions for the client, as internet devices of all shapes and sizes continue to proliferate. Responsive design is the real deal. It is not a fad. It’s a legitimate attempt to address the massive challenge of delivering great experiences to this explosion of devices and browsers. But don’t feel like it’s the end-all be-all of website construction. This ain’t religion. This is web design. In addition, it’s encouraging that the creative process won’t be hampered by technical concerns, so all the young children out there we call consumers will be tapping and dragging your brand all the way to the top.